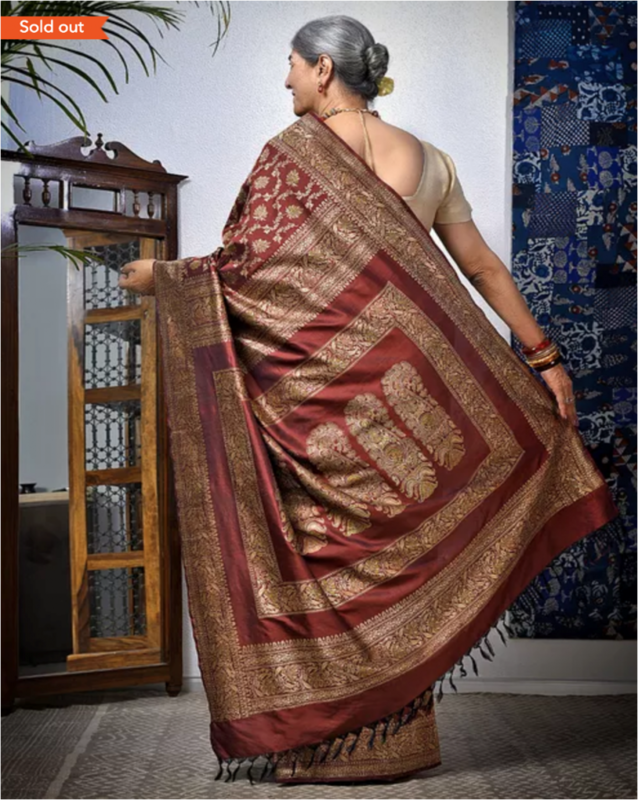 Ruby Palchoudhuri’s abiding contribution to the revival of the traditional Baluchari lies in her pioneering efforts to work with Kallu Hafiz to create the technical infrastructure to revive the jala weave. This nostalgic piece is all about her encounters with the magnificent women with their fabulous collections and, of course, her experiences with Kallu Hafiz. It was Mitul Ghatak, my classmate at the Government College of Arts and Crafts, who led me into the wondrous world of the Baluchari weave. Mitul, sister of the famous Mahasweta Devi, showed me a Baluchari sari belonging to her Mother. I had never seen anything so beautifully intricate before. The sisters’ engagement with the Baluchari began when their father was posted in Murshidabad. This was an illustrious family with celebrated artists and poets, among others, Ritwick Ghatak, the famous film-maker. 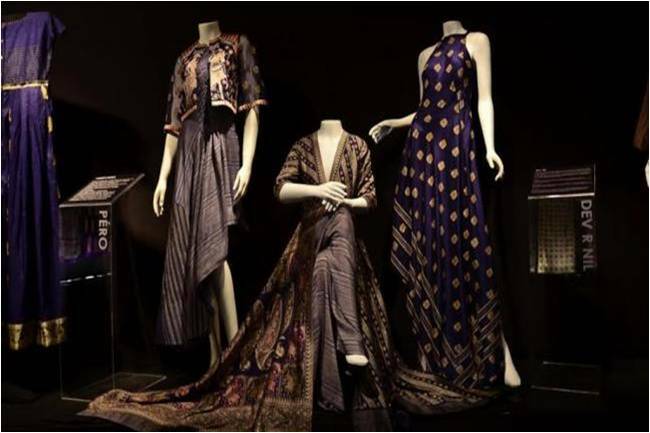 If the first encounter was charming, there was much more to come because I was to encounter the magnificent Mme Krishna Riboud in the early 1940s in London in her purple butidar masterpiece. Thus was stoked my love affair with the Baluchari, with its delectable designs, in the softest of silken rustle, that continues till today. This account is more about my personal engagement with the Baluchari; from a stage of innocence about it to one of overwhelming passion to cherish it and work to make it immortal by supporting the Baluchari master-weavers. Much has been written about the textile; not so much about its bewitching impact on 20-something- old, fashion-conscious minds of the forties. 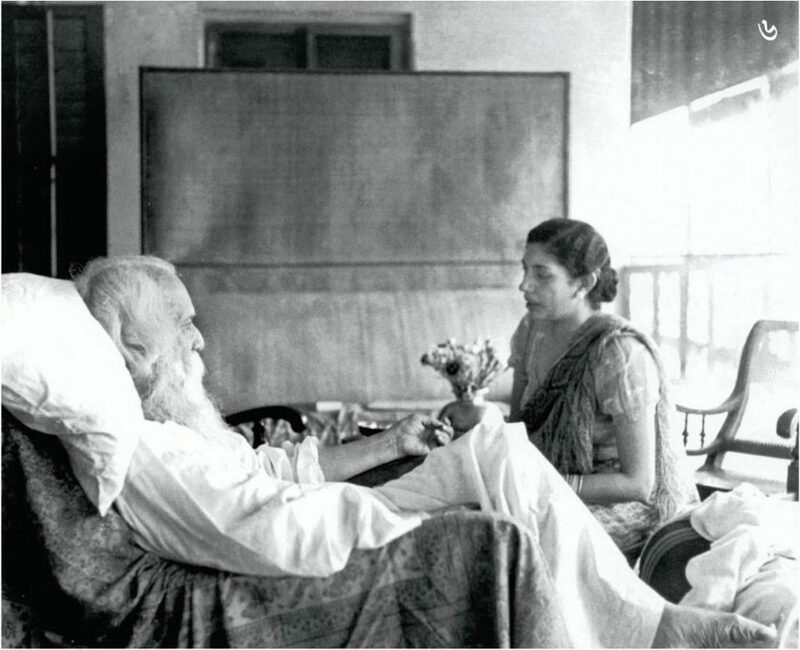 Mme Krishna Riboud was closely connected with Tagore family, who were patrons of everything creative and certainly of the Baluchari, which flourished on the bank of the Bhagirathi in Murshidabad. 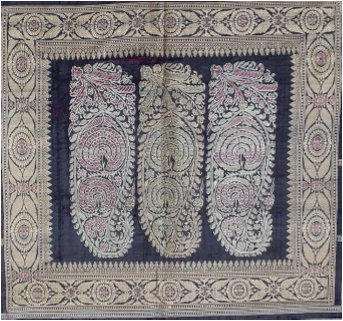 There were families royal and aristocratic, who patronised the weavers along with the educated, progressive Bengali women who were connoisseurs of the weave that expressed artistic imagery using the most sophisticated of techniques that their nimble fingers and creative minds could muster, over silk that was just as lustrous. My mind goes back to ta photograph of Saroda Devi, wife of Mahorshi Debendra Nath Tagore, sitting on a bed, her grey hair covering her back, donning another masterpiece (describe your memory of the saree). The Thakurbari ladies played an important role in the renaissance of the region. Their courage to ignore the Brahminical social customs of orthodox Hindus and come out of Pardha created a new influence on a great number of women in Bengal, whose hearts and minds turned towards many facets of society and certainly the rich creative heritage of the region, that included the Baluchari. To replicate man and nature in their many moods and poses; to execute with equal elan mythological to moghul motifs to symbols of the raj, from flowers and birds to social themes, to change with the changing times was par for the course but what they also delivered was exquisite workmanship that was almost bewitching. Legend has it that this was the weave that charmed Raja Manshingh of Rajasthan who came to conquer Maharaja Pratapaditya in the early 17th century. Not only the Tagore family, ladies of the Brahmo Samaj adored the Baluchari. Krishna Riboud, a classical beauty, who married a French Count, became a collector and started a Textile Research Centre “AEDTA” in Paris and received the Legion d’honneur, the highest award given by the President of France. 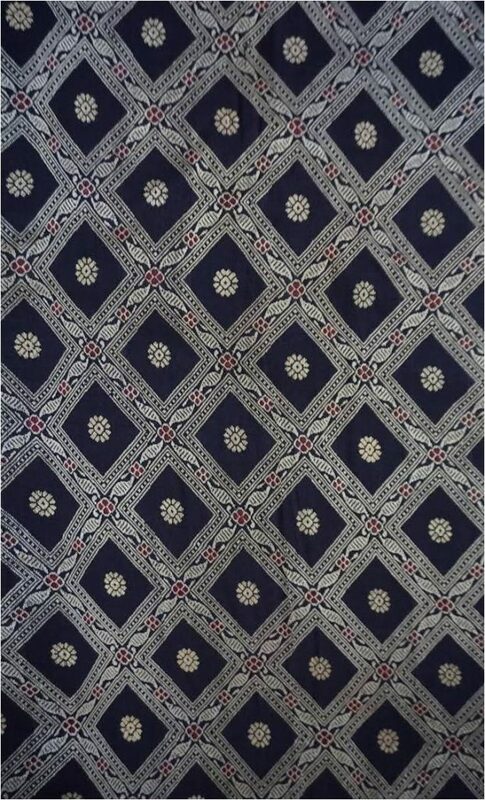 I remember being in Paris in the late eighties, when she invited me to her centre to see her textile collection with a mind-boggling number of Baluchari pieces created by master weavers. 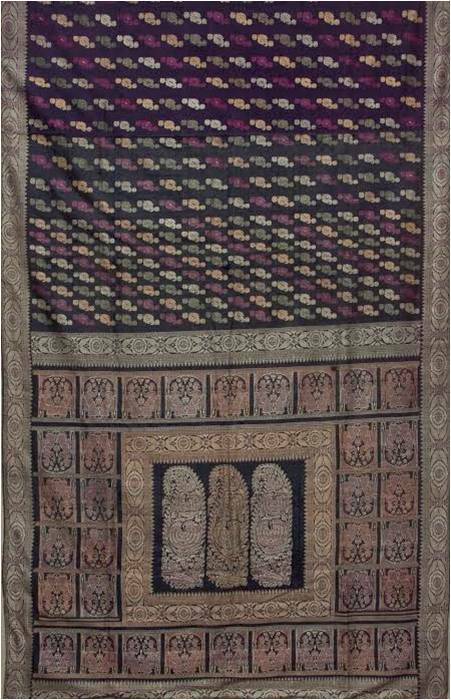 Of these gifted weavers, probably the most celebrated was Dubraj Das, a 19th century master craftsman, believed to have been born to a family of snake charmers but who went on to charm the looms into weaving delightful textures. A wanderer that he was, Dubraj settled in the Baluchar village and came to master the art of Jala weaving, preferring to weave flowers and not figures. More importantly, over time, he started using religious text in his weaves. For the rest, fellow weavers from the village and from neighbouring hamlets created their styles with minor deviations, never hesitating to present that changing world around them through their patterns. 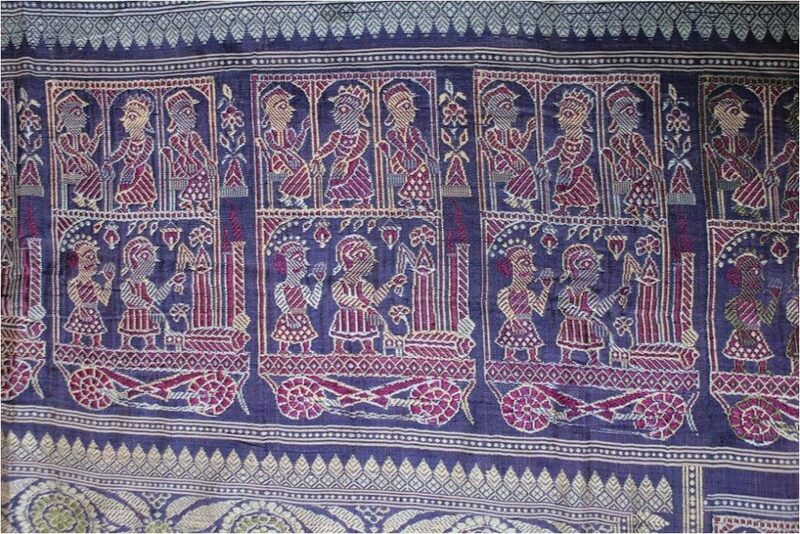 From Baluchar to Bishnupur, they enamoured everyone who came to see them weave. 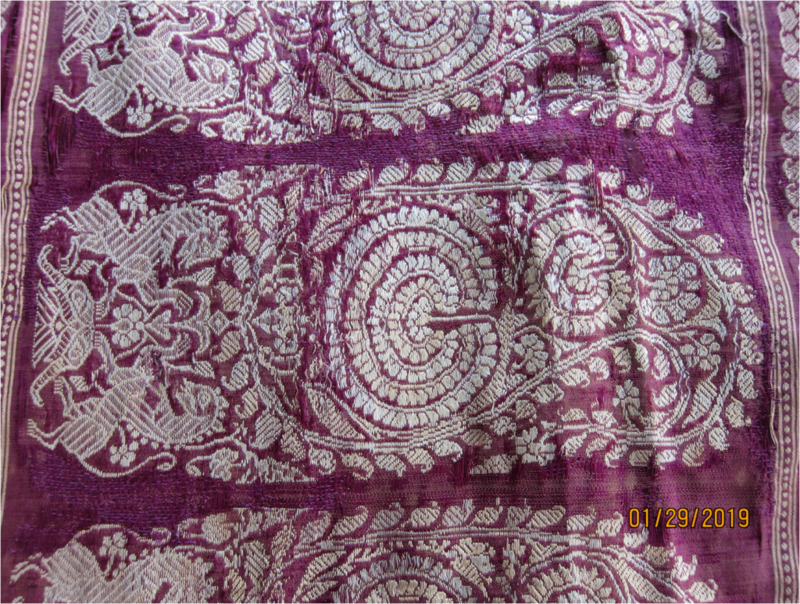 The silk yarn that they used was degummed mulberry silk, with low twist that is used both in warp and weft. 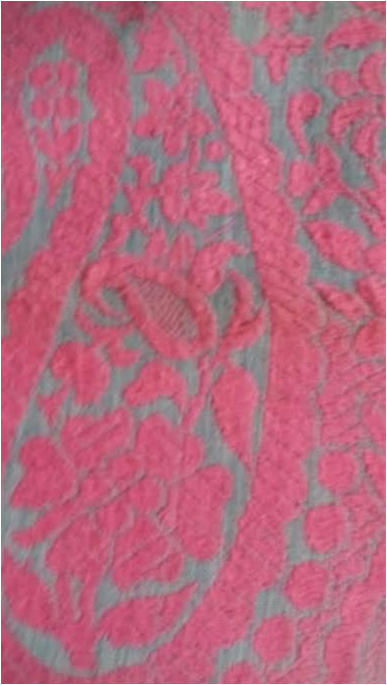 The design is woven in extra weft. 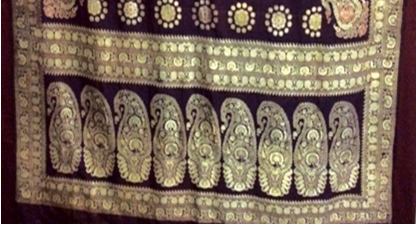 As the application for GI status would confirm, “the intricate pallu design developed in different layers in rectangular fashion in boxes makes the saree unique. No zari or metallic yarn is used for designing”. 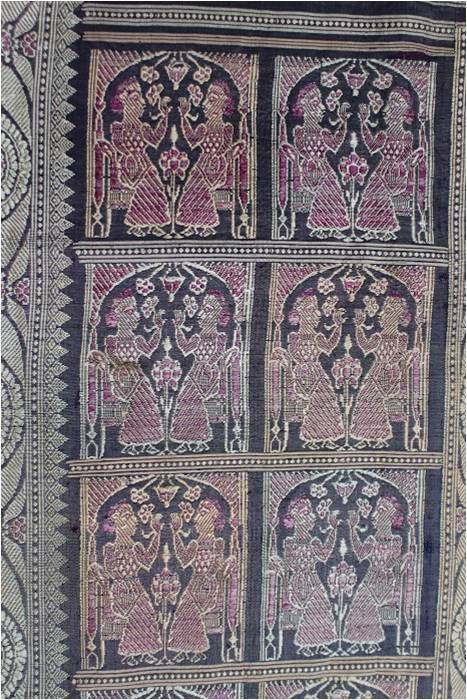 It was the jala technology that made the sarees unique as the weavers rendered the designs, mainly on the aanchals (pallus) and won for the sari the status of Geographical indication in India. 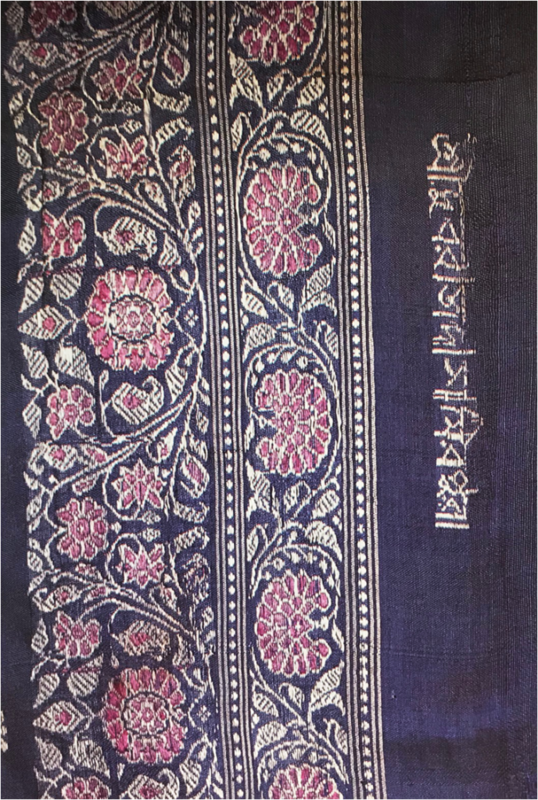 The Baluchari was destined to become a closer influence on my life courtesy Indubala Basu, early 19th century, an outstanding lady, a graduate from Bethune College who possessed quite a collection. 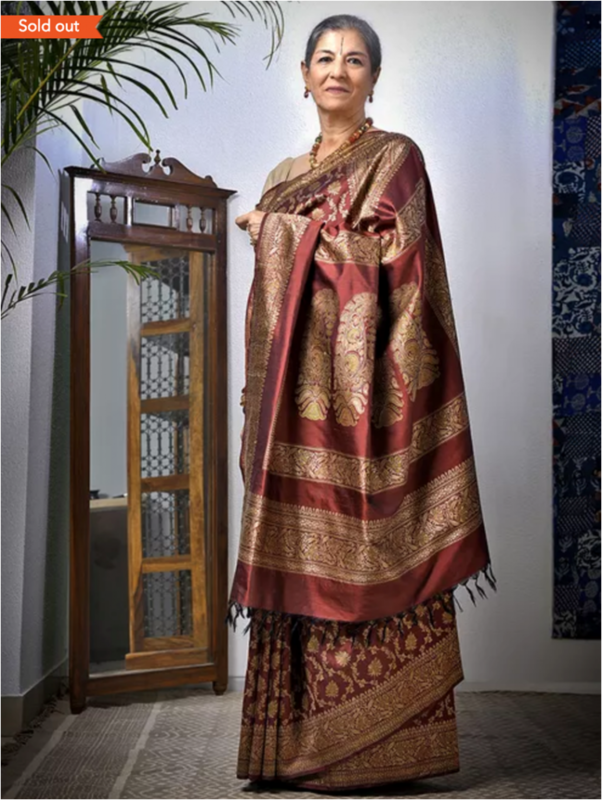 This was inherited by her equally illustrious daughter, Ila Palchoudhuri, who was a Member of Parliament and committed to doing something for Bengal’s textile traditions. She was also my mother-in-law, who looked ravishing in her Balucharis; some of which, it has been my fortune to inherit. This is a piece of fortune that I have loved to share with other connoisseurs at Baluchari expositions in India and overseas. It was also from her that I derived the inspiration to work for the preservation of Bengal’s creative heritage. There was also Radha Sundari Palchoudhuri, my grand mother-in-law, wife of Biprodas Palchoudhuri, who owned a fabulous piece, now in the possession of her grand-daughter, my husband’s cousin. Another outstanding woman, an excellent rider, she supervised her estates on horseback and had started many charities and generated income for the poor people. I recall her in a Baluchari sari with a triangular lace head cover in a Brahmo style, though she was not a Brahmo. 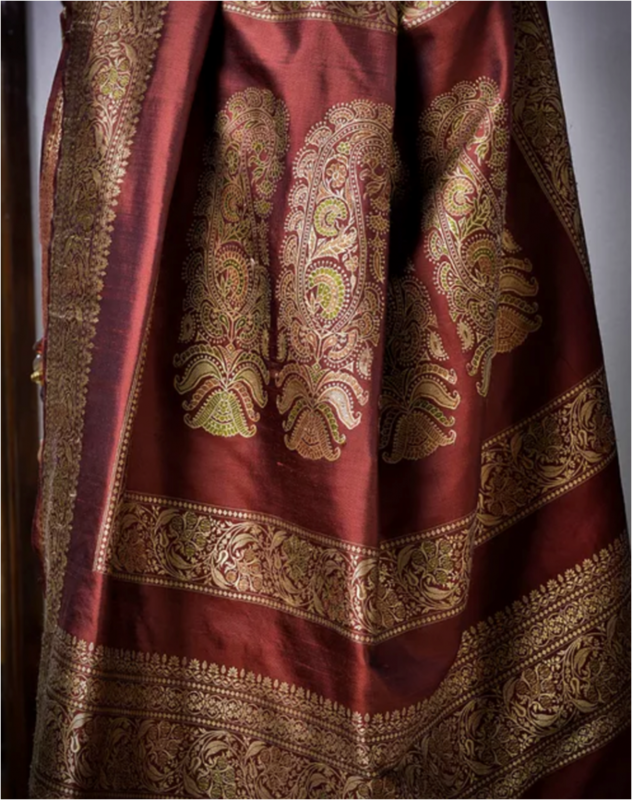 The Thakurbari ladies had set many sartorial styles with the sari with differently designed blouses and often with interesting covers for the head, in what might have been a Victorian influence. Suniti Devi, from Cooch Behar, was another aficionado of the Baluchari. 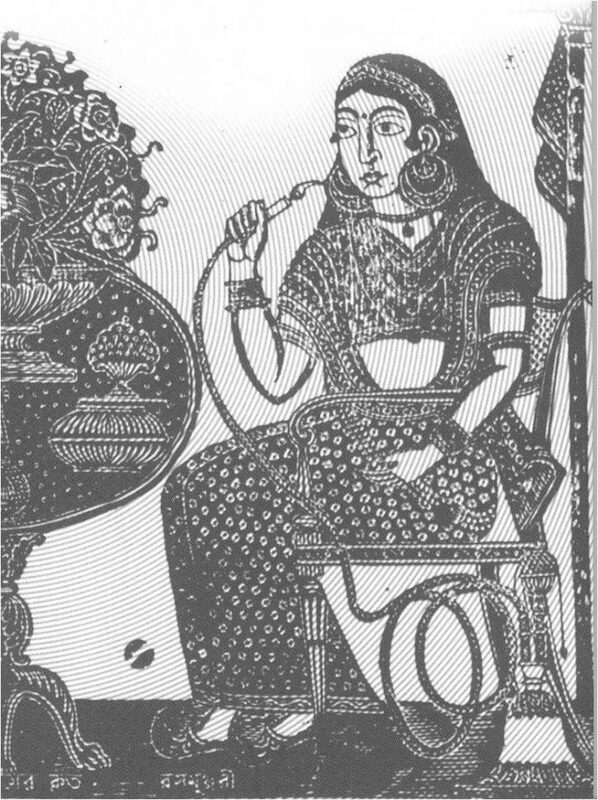 Her family, a member of the Brahmo Samaj, was known to be educationists and one of the daughters, Tapati, who inherited an antique masterpiece, was not just a wonderfully enlightened woman but a member of Crafts Council of West Bengal as well. 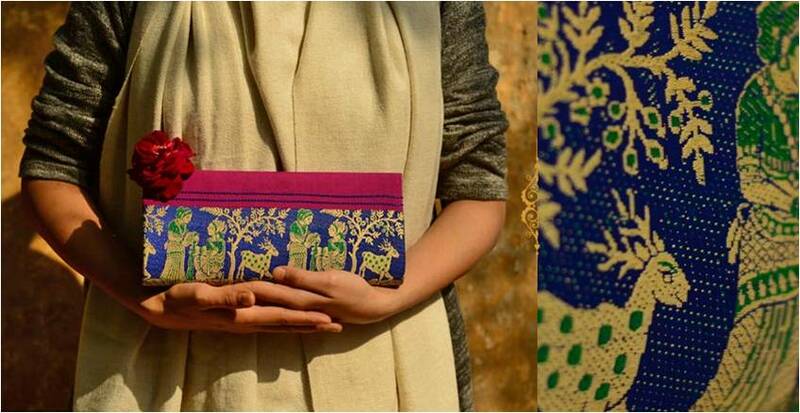 Suniti Devi’s piece was passed down to her grand-daughter, Rita Bhimani, another cultural icon of the present times. 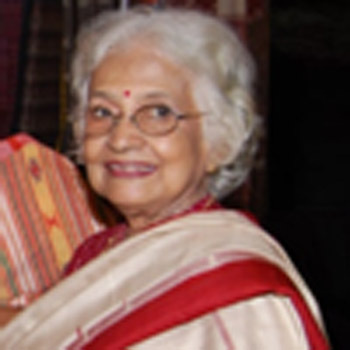 There was also the highly cultured and educated Nilima Mitra, later Majumder, brought up in Beadon Street, was a frequent visitor to Rabindranath Tagore’s home in Jorasanko. Her mother made sure that she received singing lessons from the erudite Dinu Thakur, from the Tagore family. 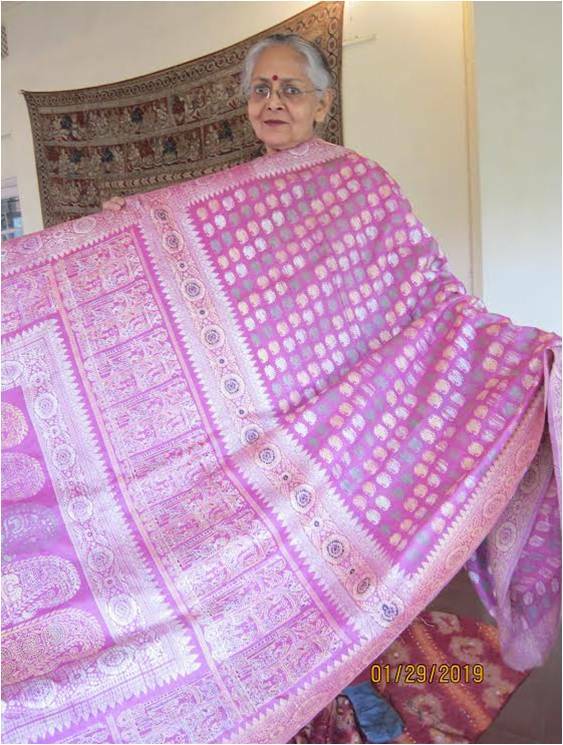 More importantly, she owned a beautiful Baluchari sari that is with her grand-daughter now. 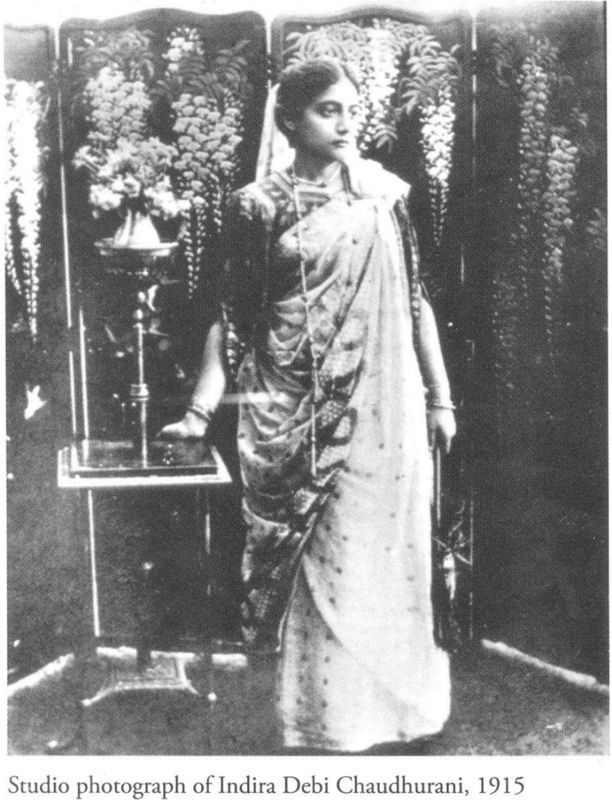 The Thakurbari ladies had set many sartorial styles with the sari with differently designed blouses and often with interesting covers for the head, in what might have been a Victorian influence. 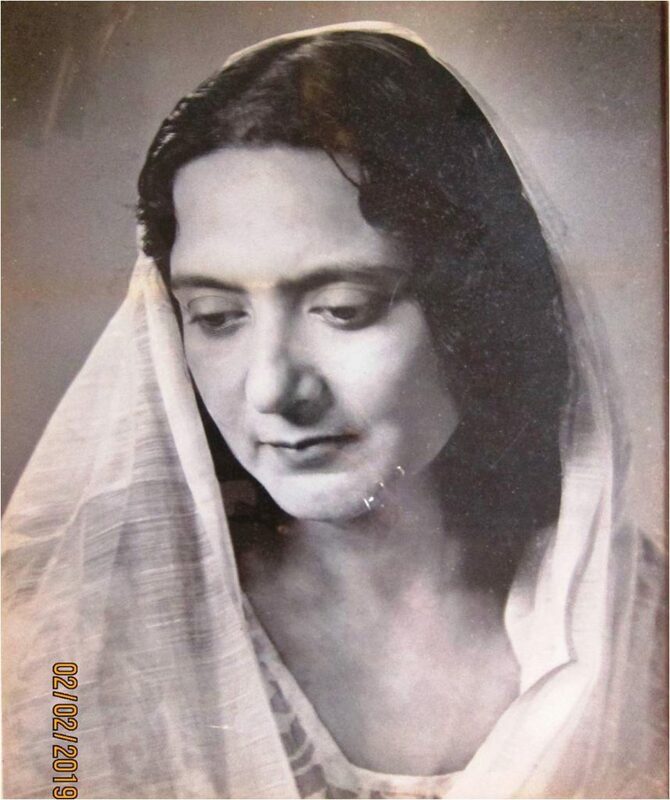 I also recall the highly cultured and educated Nilima Mitra, later Majumder, who was raised in Beadon Street, North Calcutta, and was a frequent visitor to Rabindranath Tagore’s home in Jorasanko. 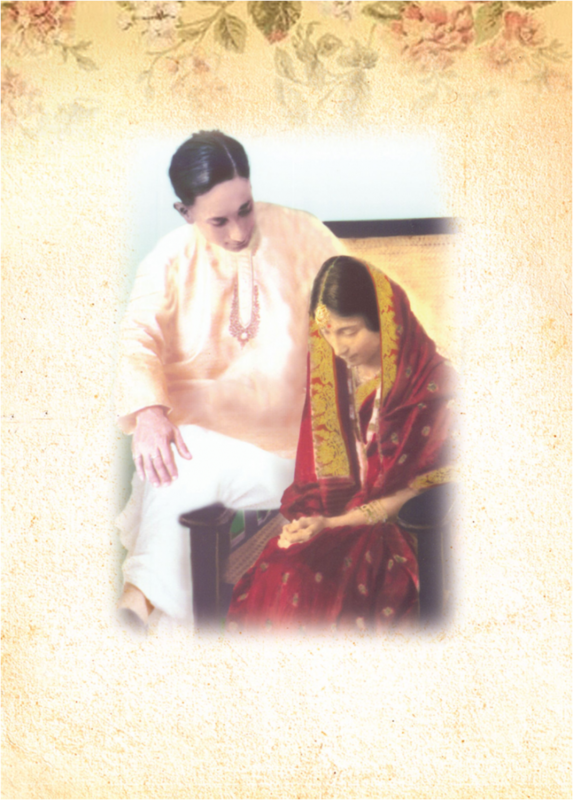 The picture here of her wedding with Benoy Majundar, and she is wearing a Baluchari. Two other Balucharis of hers that survive are carefully preserved with her daugher, Gini Sen, who is secretary Crafts Council of West Bengal. There were many other remarkable ladies who had even more remarkable collections. 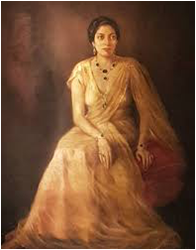 Indira Devi Choudhurani, a descendent of SatyendraNath Tagore, had a particularly exquisite piece that was inherited by Pranati Tagore, a great Bengali scholar. 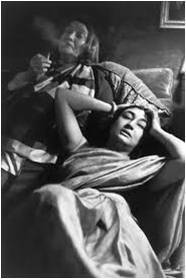 The most captivating collection though must surely have been Lady Ranu Mukherjee’s. The grand lady was amongst the most passionate patrons of the art that she kept in her mansion, which was like a Museum for she owned a great collection of precious textiles. My entry into her fabled world was through her daughter, Geeta. 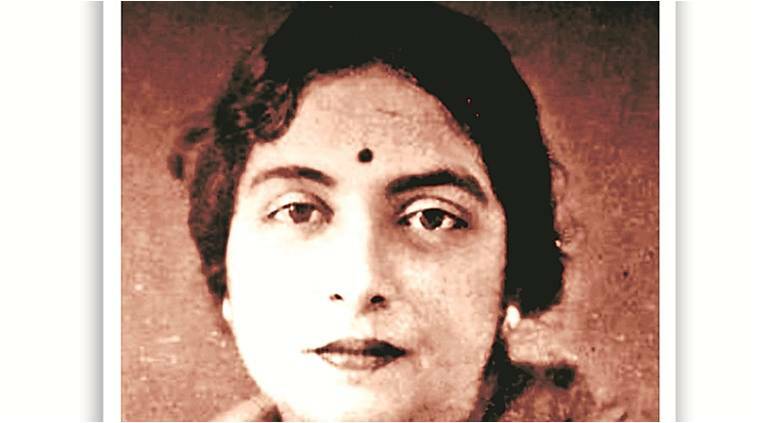 It was not everyday that a young lady from the mofussils​ of Bengal, in her early encounters with Calcutta of the Raj, in the 1940s, would find herself in the company of royalty and more. Yet it was that Geeta, my friend in Loreto College, who invited me home. With open-mouthed wonder I took it all in; the opulence, the artefacts, the style, the kaayda-kanoon of the Mookerjee household but more tellingly it was her mother who held me in thrall. 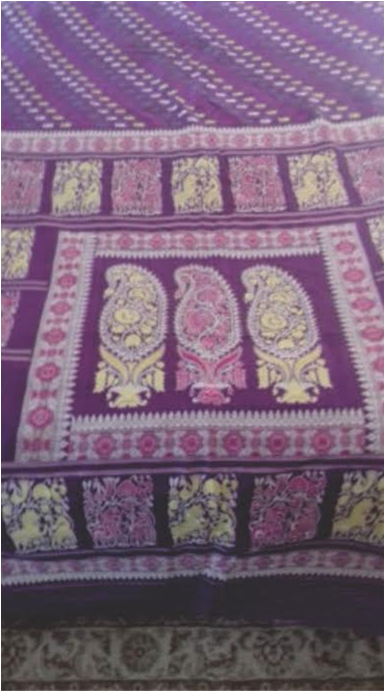 She appeared, the very embodiment of beauty, in a Baluchari, dark plum with floral border with paisley butis. 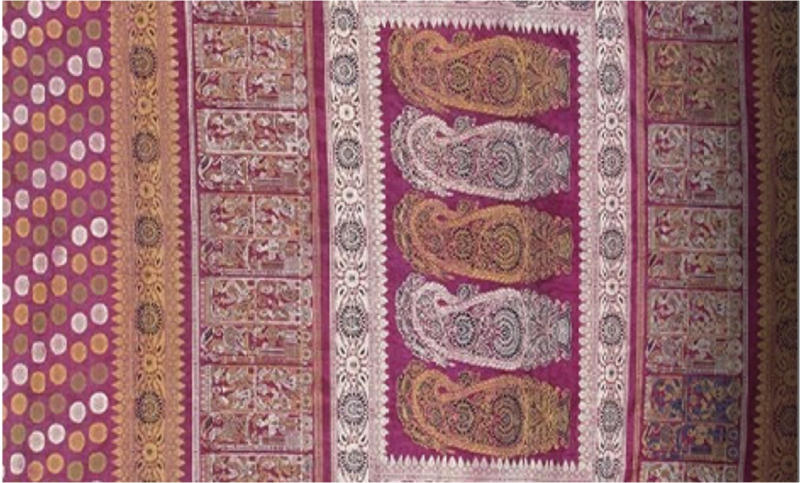 The aanchal was woven with the three large paisley in the centre framed with a border in a box-like fashion. Around this centre box on all four sides in box like fashion there were nawabs smoking hookas and begums holding roses; a typically traditional Baluchari. As part of the accessories she wore strings of Basra pearls. Every minute detail sticks to my mind.Lady Ranu had a fabulous collection and often wore Balucharis with matching gems set in either diamond or pearls; never failing to stun people around her. I graduated from being a stunned admirer of the textile to an ardent supporter under the watchful eyes of Kamala Devi Chattopadhyay, who was my mentor. 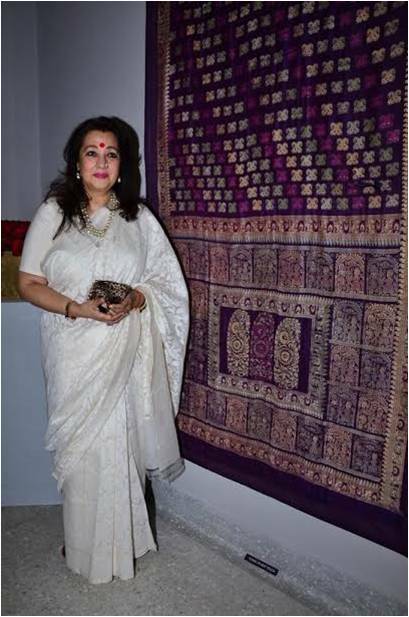 It was she who first sought to revive the Baluchari with help from Subho Tagore – who showed me to his magnificent collection – though we realized that this would be very difficult because the weave was complex, time-consuming and not cost effective. 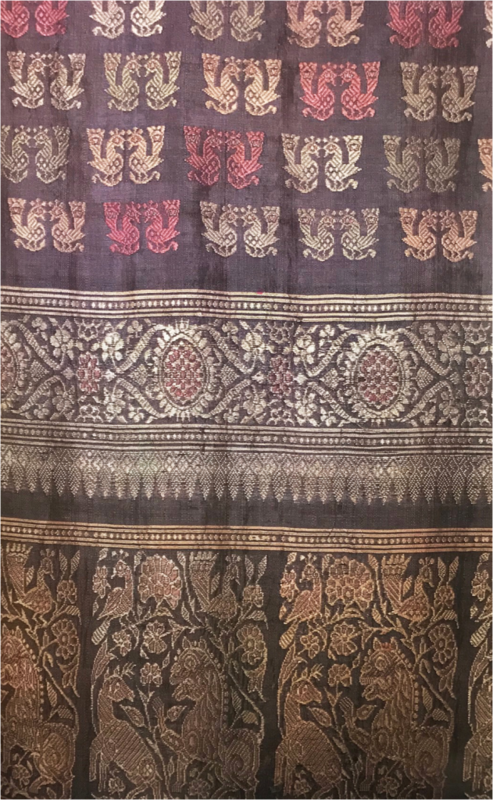 Kamala Devi was, however, determined and took a sample of the Baluchari to Ali Hassan (Kallu Hafiz) in Varanasi in her effort to revive Baluchari weave which was not possible in Bengal. 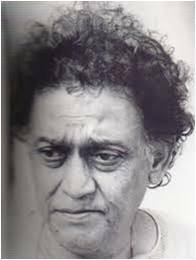 Thus began my association with Kallu Hafiz; and one that that I enjoyed every minute because of the sheer joy of creativity that surrounded him. We must have made some noise of success because I was soon commissioned to produce a 16×12 feet Baluchari wall hanging by ITC; a project that took two and a half years, won thunderous accolades and gave me a lifetime of satisfaction. 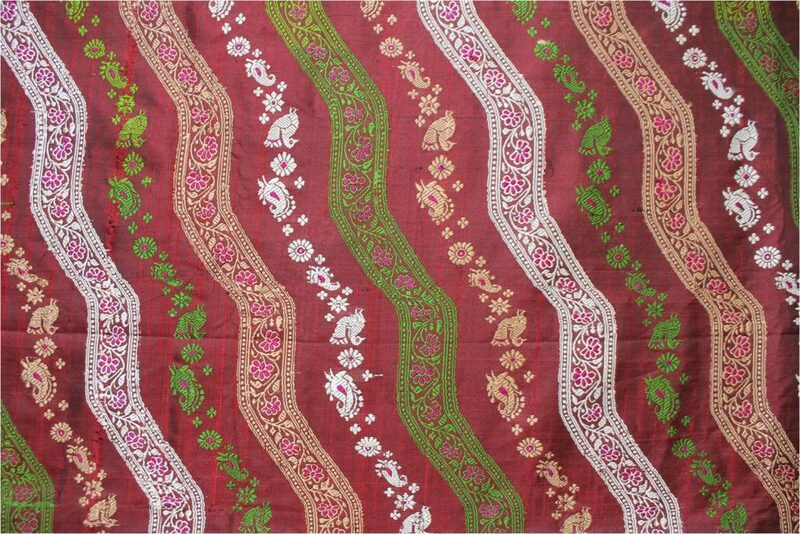 Never in the history of Benaras had such a large piece been woven. A room was constructed to house the large jala. I went to meet Kallu in his workshop I showed him the technical drawing prepared under the supervision of the famous artist, Sunil Das, then head of Weavers Service Centre, Kolkata. Kalluji took a look at the drawing and all he said to me “Ho jaiga”. My life was made! Kallu Hafiz’s ancestors came from Bokhara, Uzbekistan. So inspiring was my association with him that I visited the grave of Kallu’s great grand-father when in Uzbekistan. The family was famous for the Nakshabandi technique, which was later brought to India by the Mughals. It was Kallu Hafiz’s studio that took my mind back to the home of Nabin Moira of Baghbazar, the creator of the Rosogolla (the sweet maker). His wife KshirodMoyee Devi wore a Baluchari sari as she supervised the sweet shop in their family house in Baghbazar – a splendid heritage building full of murals painted by Jamini Roy. The roof on the courtyard was collapsible so that they could use the court all the year round. It was the courtyard atmosphere that was created in Kallu Hafiz’s place. 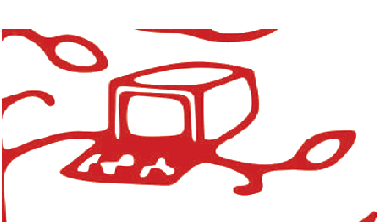 The drawing that Sunil Das had prepared was both magnificent and complex. 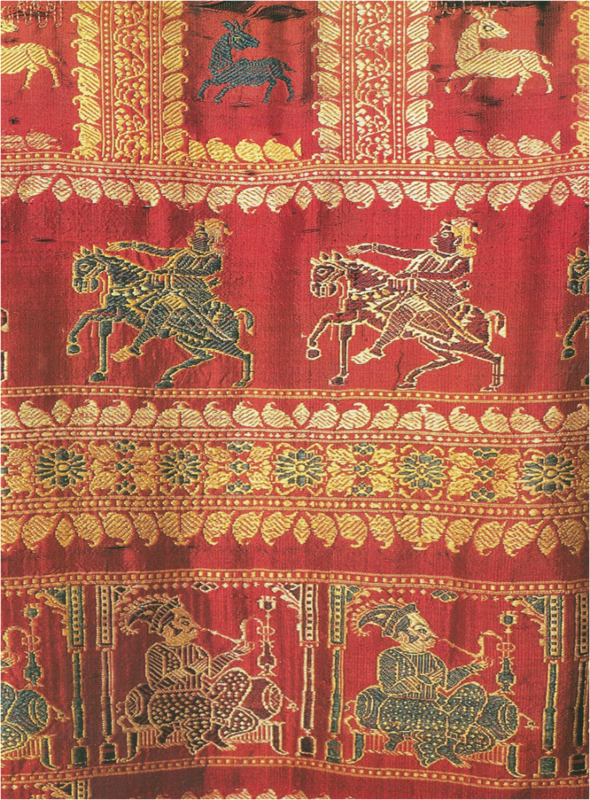 There were several rows borders in between rows of horses, elephants, and typical Balucharikolkays (paisleys). The central area had women figures planting tobacco for this was to go up at the BAT headquarters in London. The base colours were pistachio green with pink, purple and cream. Each motif was outlined by gold threads, as was asked for by the client. The reverse was all gold like a Kingkhab. 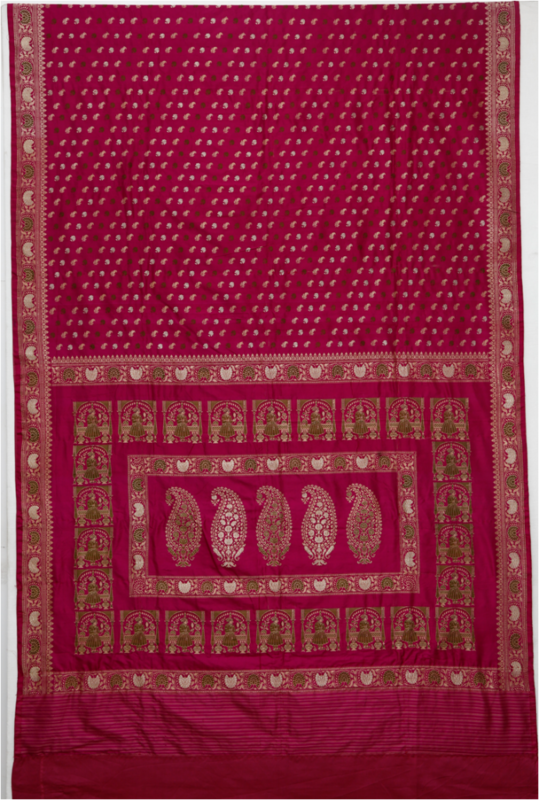 It took six months to prepare the frame to harness the yarn, which is what Nakshibandi does. There were three weavers who sat at the pit loom while two sat on the machaan above, to handle the yarns from the harness. Over two years they worked on the masterpiece that was unfortunately lost to India, because it was taken to the UK and my efforts to track the piece since then have failed. 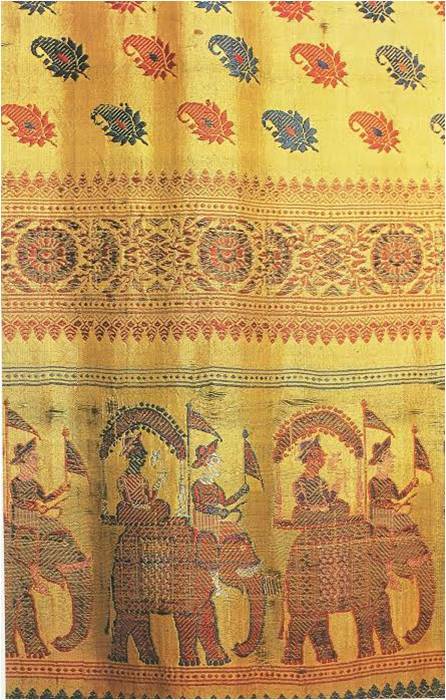 Later, when the Benarasi sari became an item of high-fashion in Bengal, ladies were caught in a bind: Baluchari or Benarasi as the wedding sari. For a long time, the Baluchari prevailed. Today, it gives me great joy to see the young wearing the Baluchari and even five star hotels having their hostesses dressed in them. It also pleases me no end to see a Kallu Hafiz revival Baluchari command a Rs 10 lakh price tag. That is when I see a bit of Kamala Devi Chattopadhyay’s enduring contribution to the heritage craft and perhaps a bit of me too. The regret is that we lost Kallu Hafiz’s original revival piece that should have been preserved in Bengal as a part of the state’s great Baluchari heritage and not lying in some unnoticed corridors of a corporate giant without anyone having a clue about its great cultural significance.